Proper shoe care involves much more than just regularly cleaning your shoes. Correctly putting on and taking off shoes, committing to regular breaks from wear and using shoe shapers for storage are all key components of comprehensive shoe care. Your reward: shoes that are a great deal more durable. Once you have purchased a sophisticated, perfect-fitting, high-quality men's shoe, then the most difficult part is already over. That being said, shoe ownership entails more than simply spending money. Quality men's shoes arrive in mint condition. If you wish to keep them that way for many happy years to come, you will need to brush up on your shoe care know-how. Well-cared-for footwear with a sophisticated look serves as a sort of calling card for its owner. Shoe care begins with correctly putting shoes on and taking shoes off. An improper approach can damage the shoe and thereby significantly diminish its lifespan. Furthermore, when you take off your shoes after a long day in the office, you should immediately store them with a shoe shaper. Using a shoe shaper preserves shoe form and encourages proper ventilation during breaks from wear. If you follow these recommendations and also regularly and thoroughly clean your shoes, you will enjoy your shoes for a very long time. And, should shoe repairs one day still be necessary, simply hand over your footwear to a master cobbler. 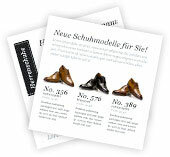 You will be surprised by how quickly and easily he will bring your quality shoes back into form. None of the above is new knowledge, as a look at shoe history confirms. 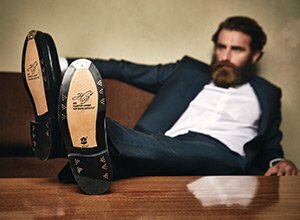 Just as classic types of men's shoes have hardly changed over the years in terms of shoemaking, production-method and construction, dress code and shoe care have also remained largely unchanged. Leather expertise is equally storied. Leather is a natural material that protects our feet from the environment while helping to ensure a perfect shoe fit. It all comes full circle, since a perfect fit in turn significantly supports foot health. Leather retains moisture. When shoe leather gets wet it can cause shoes to lose their form, and even accrue lasting damage. Breaks from wear prevent this from occurring, and are essential to maintaining the durability of your quality men's shoes. A few small measures can prolong the lifespan of your shoe. Correctly and gently putting shoes on and taking shoes off, with a shoe horn and with your hands, protects your shoes and prevents the uppers from damage. Unworn men's shoes lose their form and sturdiness over time. Shoe shapers help prevent this from happening. They also smooth out creases from wear and help men's shoes dry. The best shoe shapers are made of wood. When you know exactly how to go about cleaning your leather shoes, a tedious-seeming task becomes a gratifying process. The results speak for themselves: durable, shiny shoe leather that will extends the lifespan of your shoes.